Minnesota has the potential to become a trauma-informed state if the hard work is done to raise awareness of ACEs and the impact of toxic stress on brain development, says third-term state representative Rena Moran (D-St. Paul). 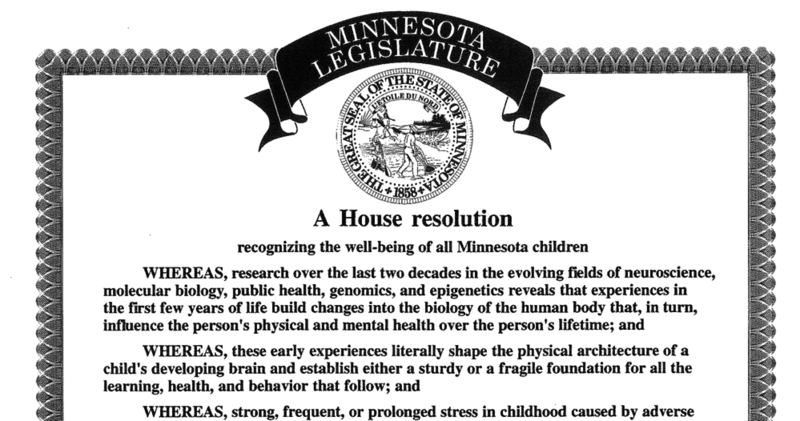 Moran led the effort to have a resolution—similar to ones passed in Wisconsin and California—read in the legislature in March to educate lawmakers and the public about ACEs and related research. Democrats and Republicans took turns reading the resolution. According to Moran, there was insufficient bi-partisan support to hold a hearing and take a specific vote on legislation. Several of the legislators who opposed a full hearing on the issue of childhood trauma revealed privately to Moran their own experiences of childhood abuse. Moran believes that punitive policies that negatively impact children, especially those in communities of color, must be eliminated. The policies that are ripe for change are those that relate to school discipline and result in inappropriate placements in special education and feed the school-to-prison pipeline. 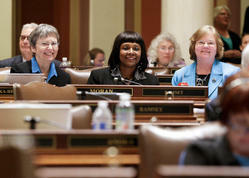 Solutions that require approval of new funding are often met with opposition by many lawmakers. To overcome this reluctance, Moran says a strong case must be made that proposed programs are evidence-based and can demonstrate a solid return on investment. Even when there is a strong case that money can be saved in the long run through prevention of health and social problems, increased spending is still a hard sell, she says. Moran’s life story is one of overcoming adversity. She was homeless for a time, when her children were young. She now devotes herself to improving outcomes for children and strengthening families. She brings this personal experience and a degree in early childhood education to her roles as state legislator and director of prevention initiative and parent leadership for Minnesota Communities Caring for Children(MCCC, the Minnesota Chapter of Prevent Child Abuse America and Circle of Parents Minnesota). Moran learned about the ACE Study and related research several years ago from Karina Forrest-Perkins, a former colleague who served as executive director of Prevent Child Abuse Minnesota, and is now executive director of The Wayside House, a women’s recovery organization. Forrest-Perkins learned about the research while working in mental health in Oklahoma. Beyond raising awareness among her colleagues about ACEs, trauma, and resilience, Moran is searching for ideas from other states and communities on what is working to prevent ACEs and to build resiliency in individuals and in communities. The resolution is one small part of laying the groundwork to build awareness that is needed to make more substantial inroads in the next short session, starting in March and ending in May, and beyond. Childhood trauma also comes for alienation, which is a form of child abuse. Alienation happens when a child or children are being withheld from extended family whether it be father/mother, grandparents, siblings, aunts, uncles, cousins etc. Anyone who deals with children needs to be informed of this epidemic. It is happening in Minnesota and all over the entire world. I’m always glad to hear of more places doing this. What states and areas are included in this training and is there anywhere overseas that follows ACES policies and or training? Hi, Nora: If you’re interested in finding out more about what nations, states, cities, and counties are doing, join ACEsConnection.com. It’s a social network for people who are implementing — or thinking about implementing — trauma-informed and resilience-building practices based on ACEs research. About 10% of our 5600 members are from outside the U.S.